Love the 6.7 Ct Square Amethyst Cushion-Cut Pendant. Beautiful! I like all the jewelry on the site, but I really like the Sterling Silver Etruscan Amethyst Gemstone Earrings! I like the Sterling Silver Multi-Shape, Multi-Gemstone Bracelet. Wow! So pretty! Adding to my wish list now! My favorite is the jade & jasper wrap. And so many others! I love Moonstones.So I pick Sterling Silver Moonstone Bracelet as my favorite. I love the Sterling Silver Peridot and Pearl Jewelry! I like the Sterling Silver Frog Pendant. 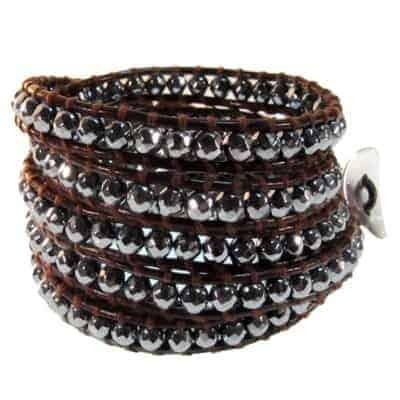 I like the Black Leather Wrap Bracelet with Pearls! I like the Sterling Silver 5 Carat Cushion Cut CZ Ring. So many beautiful things. But the Anna Sterling Silver Moonstone Pendant with Garnet Accent catched my eye. I want the Sterling Silver Moonstone Pendant with Garnet Accent! I like the garnet drop earrings! Happy holidays! Thanks so much for the fantastic giveaway! I really like the amythyst pendant necklace. It’s so pretty. I also like a lot of the celtic jewelry. My favorite piece of jewelery is the Anna Sterling Silver Moonstone Pendant with Iolite Accent. I LOVE the Sterling Silver Seahorse Pendant with an 18 inch snake chain!